Baking with sourdough has its consequences. You have to fit it into your work and life schedule – the fermentation/rising/proofing times are so much longer than when using commercial fast-action yeast! You have to plan for a 9-hour time span from start mixing to pulling the baked bread out of the oven. Baking after-work is out of the question, so the weekends remain unless I want to get up very early or stay awake all night… not a long-term viable option. 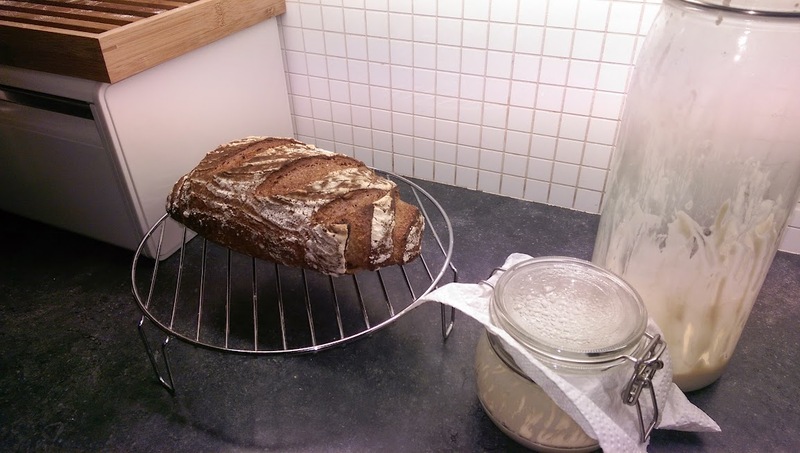 In order to find a way that allows for work during the day, and baking sourdough bread at night, I changed this routine. I did the “bulk fermentation” (the first rise after kneading the dough into a ball) in the fridge at 4 degrees centigrade instead of at room temperature, and it turned out to be a success! Fermentation is actually a better name for the process of rising – the yeast consumes sugars and produces alcohol and CO2. The bacteria in the sourdough not only produce lactic and acetic acids but also develop the flavours in the dough. The longer you ferment the dough, the more flavour it gets! Chances are that your bread will become somewhat more sour as well, but I found no evidence of that in my breads. That is why fermentation in the fridge is not a bad idea at all. The yeast’s metabolic rate is of course a lot lower in the fridge compared to room temperature, therefore the dough can be left alone for much longer when it sits in your fridge. That extra resting time enables me to divide the baking process up. I kept the dough in my fridge for 22 hours (!) and then took it out to warm up to kitchen temperature for two hours. After the 8 o’clock news, I mixed the ingredients to incorporate all the moisture, and hand-kneaded it for 10 minutes (I love hand-kneading… never use a machine). I then placed the ball of dough in an oiled bowl covered with cling film. That went into the fridge for 22 hours. Next evening, I took it out of the fridge and left to acclimatize in the kitchen for 2 hours. Then I flattened the dough gently, and shaped it and put it in a flour-dusted proofing basket (a birthday present from my wife), and left it there (covered with cling film) for another 2 hours at room temperature. I turned the risen dough over onto a baking tray covered with a silicone mat (ideal material for baking a bread, it does not stick), slashed the top and baked for 45 minutes (first 20 minutes at 235 degrees C with steam in the oven, then 25 minutes at 220 degrees C without steam). The taste of the bread is great! it has complex and subtle flavours and, only the slightest hint of sourness despite the long fermentation time. 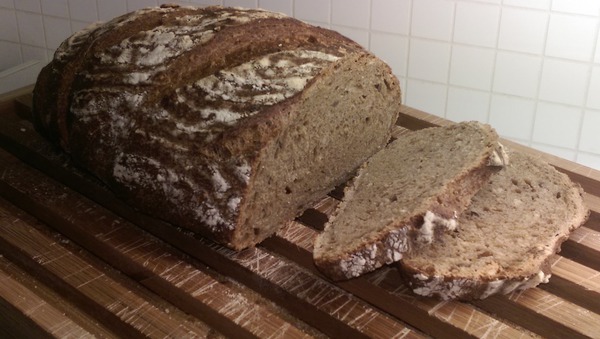 The typical nutty-sweer flavour of the Waldkorn bread mix is altered by the sourdough’s own flavouring process. My son was not yet sure if he likes this better than the version I usually bake – using fast-action yeast instead of sourdough. Certainly, this sourdough bread is a lot smaller in size… which I like better than the “fluffiness” of the bread baked with commercial yeast. Posted: 4 June, 2014 in Me, Recipes. Looks awesome! I had a sourdough starter, but just forgot to feed it. I should get another one going. I’d generally let mine proof overnight, then do the 2nd rise all day, baking it early evening/night. I should try a slow rise in the fridge. I found that sourdough breads need to be way wetter than regular yeast doughs, too. These long proofing times at room temperatures, did you ever overproof your dough? My very first breads were all overproofed and as a result, ended up as clumps of dense dough instead of a beautifully risen bread with airy crumb. Care to share your method/recipe/techniques so I can try and match it? Hrm, I don’t think they ever overproofed. Like you, I had a 100% hydration starter. Every few days I’d dump half out, feed it with equal parts flour and boiled/filtered water. It was a wild-caught starter, so it took a few months for it to really become established. The first loaf or two with it were like Dwarven Battle Bread, but as it became established, the better the loaves became. I found that with sourdoughs, you want the dough a bit wetter than commercial yeast. Also, they don’t need to be kneaded as much. The next morning, knead again (needing to add some flour, since the dough becomes watery by yeast doing its thing), shape into loaves and let rise again…about 4-6 hours. Then I’d bake at 350 like normal. I like to bake a batch of sour dough bread on Saturday when I am home to watch it. Its my favorite. Also a hot loaf will really make your neighbors happy. I will think about trying your method. Last night’s bake, based on overnight bulk fermentation in the fridge, resulted in a bread which tastes _amazing_ but the dough had lost its strength so it kind of flowed out and flattened when I transfered it to the baking tray. The crumb structure is also too dense for my taste. It could be related to the temperature in the fridge. I have two starters: the oldest one produces good breads using the fridge fermentation method while the newer starter produces flat dense breads. It is a possibility that the yeast in the newer sourdough starter is unable to function properly at the ~ 6 degrees C inside the fridge. My first starter was jumpstarted using a grated apple along with AP flour and water, the second was created from scratch using a mix of rye, AP flour and water. The first starter has a 70% hydration while the second one is 100% hydration. Both were started in my kitchen, but iit is probable that they do not contain the exact same yeast culture. At some point, one of the many yeast variants will have taken a foothold and pushed all the contenders out. The area does not really matter (well except for the ambient temperature) as the starter’s yeast culture is grown from whatever was present on the flour. Tomorrow I am going to bake a bread using my second starter, but then fermenting during day time at room temperature. See what that does to the yeast’s capabilities. Today I had all day to bake (weekend, yay!) and I used the exact same mix of ingredients as a couple of days ago. I only bulk-fermented for about 4 hours and the dough almost climed out of the glass bowl. Today we have extreme outside temperature (31 degrees centigrade) and the fermentation took place at temps between 24 and 30 degrees. This sourdough starter definitely prefers the high temperatures! The second proofing went like mad. The dough reached the top of the banneton. Unfortunately I think I left it to rise for too long (half the time of the bulk fermentation is the rule of thumb but I left it for more than two and a half hours) and when I turned over the banneton the top cemtimeter of dough stuck to the banneton while the rest dropped onto the baking tray. I collected the boits, deflated the dough again, re-shaped it and let it proof a third time, now for a bit less than one and a half hours. I also sprinkled some corn flower into the banneton this time instead of just white four, to minimize the chances of sticking. You’re inspiring me to get another sourdough starter going.